Cracking down on terrorist financing demands an all-encompassing approach, targeting not only the full array of terrorist groups, but also the individuals, businesses, banks, criminal enterprises, and charitable and humanitarian organizations that finance terrorism. Charities and humanitarian organizations play a particularly disturbing role in terrorist financing. Many present an especially sensitive challenge to authorities, who must discern between 1) legitimate organizations, 2) organizations that are unknowingly hijacked by terrorists who divert funds to finance their activities, and 3) organizations that proactively support terrorist groups. Long before September 11, U.S. officials were aware that the financial networks of certain charitable organizations were funding terror. For example, investigators looking into the 1993 World Trade Center attack traced funding for the operation back to a company that imported holy water from Mecca to Pakistan. Only now, however, is the trend receiving the attention it properly deserves. A recent U.S. Treasury Department report acknowledged that terrorist activity is financed primarily through fundraising, more often than not through legal, nonprofit organizations. Moreover, Ambassador Francis X. Taylor, the State Department’s Coordinator for Counterterrorism, recently noted, “I believe that terrorist organizations, just like criminal enterprises, can bore into any legitimate enterprise to try to divert money for illegitimate purposes.” Although such manipulation is of tremendous concern, an even more disturbing trend is the effort of some charitable and humanitarian organizations to knowingly raise funds for, or facilitate the activities of, terrorist groups. Charitable and humanitarian organizations have long been a preferred venue for terrorist financing, with or without the knowledge of the organizations or their donors. For example, on December 14, 2001, federal officials raided the offices of the Global Relief Foundation (GRF) in Chicago and froze its assets. Days later, NATO forces raided GRF’s offices in Kosovo after receiving credible intelligence information that the foundation was involved in planning attacks against U.S. and European targets. GRF raised more than $5 million in the United States last year alone. Although much of this funding likely went to legitimate causes, investigators maintain that GRF served as an important front for al-Qaeda. Other examples of terrorist front organizations include the Hatikva Center (funding Kahane Chai), the Holy Land Foundation for Relief and Development (funding Hamas), and the al-Wafa Humanitarian Organization (funding al-Qaeda). Several charitable and humanitarian organizations have not only financed terrorist groups, but also actively facilitated terrorist operations. For example, the Mercy International Relief Organization (MIRO), along with several similar groups, played a central role in the 1998 U.S. embassy bombings in Africa. At the New York trial of four men eventually convicted of involvement in the bombings, a former al-Qaeda member named several charities as fronts for the terrorist group, including MIRO. Documents presented at the trial demonstrated that MIRO smuggled weapons from Somalia into Kenya, and that Abdullah Mohammad, one of the Nairobi bombers, delivered eight boxes of Wadi el-Hage’s belongings to MIRO’s Kenya office; el-Hage is a convicted al-Qaeda operative, and the boxes included false documents and passports. Other examples of front organizations include the International Islamic Relief Organization (along with its parent, the Muslim World League), the al-Rashid Trust, the Saudi High Commission for Aid to Bosnia, and the Benevolence International Foundation. Halting the flow of terrorist funding from charitable and humanitarian organizations is difficult, particularly since terrorist front organizations actively conceal their illegitimate activities under legitimately funded causes. Disrupting the flow of such funding is not impossible, however. Since September 11, the Bush administration has issued a series of financial-blocking orders targeting terrorist groups, front companies, and individuals. According to U.S. officials, intelligence information indicates that terrorist operatives are finding it increasingly difficult to access the funds they need to conduct further attacks, to escape the international dragnet targeting them, or to communicate effectively with cells in different parts of the world. Despite these gains, the United States must commit to a strategy that addresses the following key areas. A well-coordinated international effort is needed to target the wide array of organizations that generate and transfer terrorist funds. Many nations have followed the U.S. lead in this regard, blocking millions of dollars in terrorist assets. Nevertheless, a more formalized legal and operational agreement on combating international terrorist financing is necessary. Saudi officials have exhibited, at a minimum, a clear pattern of tolerating funds earmarked for extremist purposes. For example, one Saudi official stated that a Saudi organization created to crack down on charities that fund terrorism has been ineffective because its personnel do not want to uncover high-ranking Saudis actively financing such charities. The Saudis have taken steps to combat money laundering and freeze accounts related to the September 11 conspirators. Moreover, they recently passed new regulations governing private fundraising. Saudis are now encouraged to donate funds only through established groups operating under the direct patronage of the royal family. Unfortunately, some of these approved groups feature prominently on U.S. terrorist lists. U.S. officials complain that European allies have contributed few names to the list of alleged terrorist financiers, that most of these contributions have been domestic in nature, and that Europe has yet to act on all of the names that are already on the list. Europeans, in return, have repeatedly expressed their frustration with U.S. requests to add people or groups to terrorist lists without sufficient justification for their inclusion. The European Union (EU) recently added eleven organizations and seven individuals to its financial-blocking list. This list marks the first time the EU has frozen the assets of non-European terrorist groups; unfortunately, it also draws a fallacious distinction between the nonviolent and violent activities of terrorist groups. For example, by distinguishing between the terrorist and welfare wings of Hamas, the EU lends legitimacy to the activities of charitable organizations that facilitate terrorist operations. America’s financial war on terrorism has been hamstrung by bitter turf wars between the Treasury and Justice Departments, whose parallel task forces on terrorist financing reportedly do not share information with one another. Although such inefficiency and territoriality are disconcerting, they pale in comparison to the strategic gap seen in policymaking circles. 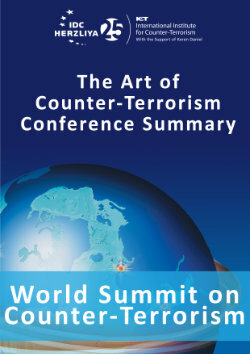 If they are to bear any fruit, counterterrorism techniques must be as comprehensive, continuous, and cooperaas possible. In order to dismantle the logistical and financial support networks of terrorist groups and prevent terrorist attacks, the governments and agencies involved must act in concert and, at a minimum, mirror the resolve displayed by terrorists themselves.